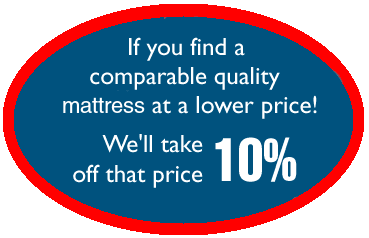 In the world of mattresses, quality varies a lot. Whether it's in the upholstery or the springs. The density of the padding will determine it's quality. For example: a foam of 1.8 lbs of density will always outlast one with a density of 1.5 lbs. The same principle applies to latex or viscose(memory foam). The quantity is also important. For the springs, the number is not the only criteria to verify, their size is also important (note that a 16 gauge is smaller than a 13 3/4). For example: a queen size mattress with 532 springs of 12 3/4 gauge is of superior quality than one with 608 springs of 14 gauge. In order to make judicious choice, it's important to ask what the components are and their quality, that's how you can shop for the best price-quality ratio. Matelas Conseil will answer all your questions with pleasure and is committed to giving you the best price-quality ratio.